Will the Real Annie Moore Please Stand Up? Megan Smolenyak is on a mission. She wants the world to know the real Annie Moore. 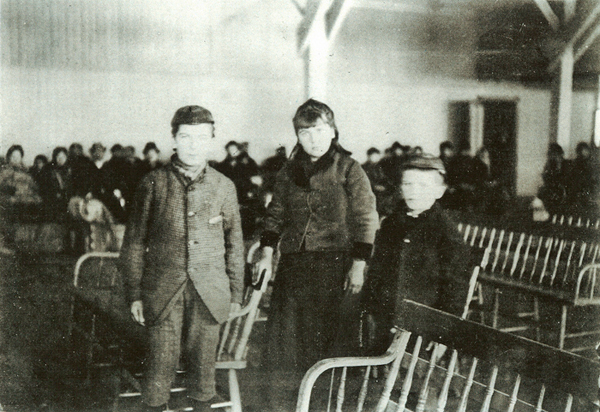 You have probably heard of her – Annie Moore was the first immigrant to arrive at Ellis Island when it opened on January 1, 1892. Annie became an instant celebrity that day, but just as quickly as the gold and silver coins were distributed and attention enveloped this girl from County Cork, Annie melted into the masses and another Annie Moore took her place in history. We didn’t know of Annie’s identity crisis until 2005 when Megan Smolenyak decided to pitch a story idea to PBS for a documentary on American immigrants. Megan had always been fascinated with Ellis Island and the immigration story, and why not explore the genealogy of Ellis Island’s first immigrant, Annie Moore? Megan is a well-known and respected genealogist, author, blogger, lecturer, finder of President Obama’s Irish roots, contributor to TV programs (Who Do You Think You Are?) and documentaries. Megan didn’t set out to bust any myths, she simply saw that little was known about Annie Moore and she wanted to see what information she could find on this important figure in American history. As she began to trace Annie Moore, Megan came across one inconsistency after another. It wasn’t long before Megan realized that the Annie Moore everyone accepted as THE Annie Moore was born in Illinois, not the first immigrant on Ellis Island. And there is more…click here to see the proof Megan has compiled showing that the wrong Annie Moore had become the heroine of the story. Megan was determined to set history straight. Last month I had the pleasure of listening as Megan shared her Annie Moore research journey via her wonderful Legacy Family History webinar, Annie Moore of Ellis Island – A Case of Historical Identity Theft. Megan explained the process of making things right – finding evidence of the real Annie Moore, contacting Annie’s descendants, bringing them together for a reunion, and even helping to get a headstone for Annie’s previously unmarked grave. The real Annie Moore didn’t go West. In fact, she never made it out of New York’s lower east side tenements. You can follow Megan’s research here. Megan has put together links, videos, audio clips, and photos to tell this fascinating story. It amazes me that so many people could be so wrong about Annie’s identity for so long. No one even thought to look into Annie’s story…until Megan. Thank you, Megan, for your persistence and dedication to learning the truth. Megan’s discoveries have tremendous impact on how each of us views our genealogy research and the lives of our immigrant ancestors. It is important that we do not simply accept stories we hear as the truth because, “That’s what Grandma always said…” Family lore is priceless, but it can be useful to back those stories up with research. That’s how we turn the stories into history. This case of mistaken identity reminds us to value all the experiences of our Irish immigrant ancestors. They didn’t all come to America and follow the path of dreams, adventure, and success that read like a Hollywood film script. But neither did all immigrants struggle in poverty-stricken urban slums. 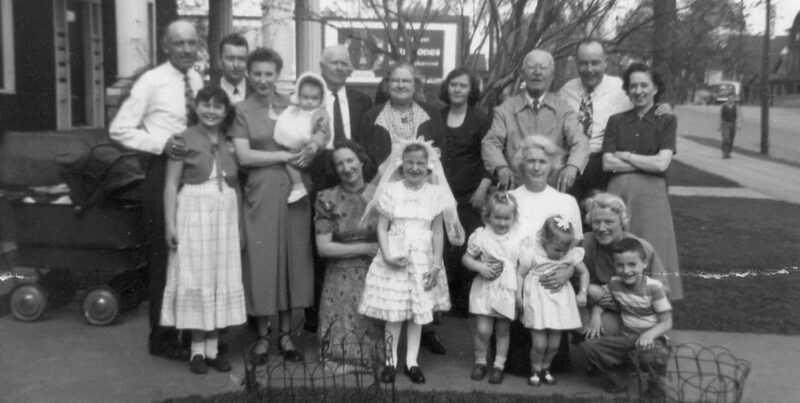 Many fell somewhere between; there is great diversity to the Irish immigrant experience and it is important to keep an open mind when researching your family’s history. 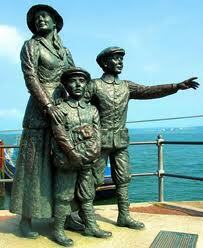 You might know that Irish artist Jeanne Rynhart is responsible for the bronze sculpture of Annie and her brothers at Cobh, as well as Annie at Ellis Island. 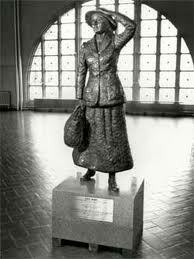 What other famous sculpture in Ireland is also the work of Ms. Rynhart? Another trivia question…who actually cast the bronze statues? Leave a comment if you have either answer! Categories: Where they went | Tags: Annie Moore, Cork, Ellis Island, identity theft, immigrants, Megan Smolenyak, mistaken identity, New York | Permalink. Hello! I’ve been following your site for some time now and finally got the courage to go ahead and give you a shout out from Atascocita Texas! Just wanted to mention keep up the fantastic job! Thank you so much, Joanne! I appreciate the kind words…have a great weekend! Thank you for distilling Megan’s research for us readers! I knew of her research, but I have not yet had time to read it in detail! I like the picture of the real Annie Moore, especially. She looks like a real person, whereas the sculpture of Annie (though very artful) looks more like the Eliza Doolittle of the film “My Fair Lady” — more befitting the myth that research has now uncovered! Thanks for this post!